1 – Tweet this: The same red-tailed hawk has been coming back to Saginaw County’s Shiawassee National Wildlife Refuge for 27 years. 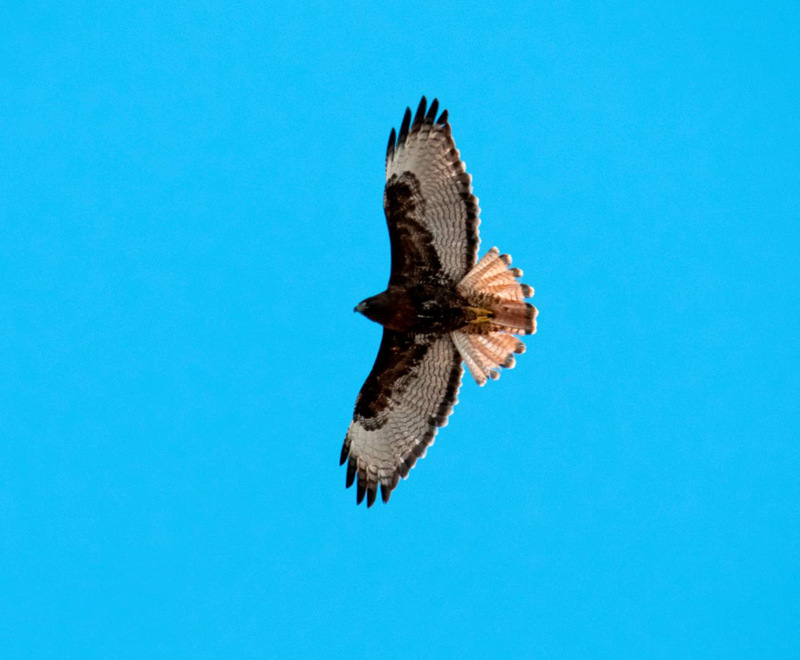 Photo of the refuge’s returning red-tailed hawk. Credit: David Stimac. Red-tailed hawks are the most common hawk found at the Refuge. Managers say they can tell the same hawk has been returning for 27 consecutive years because it’s a rare, dark phase, western red-tailed Hawk. Most redtails in the area are light phase, eastern birds. This same redtail comes back to the same area every year. The bird spents most of its time near fields on either side of Bishop Road, and fields next to the short loop of the Ferguson Bayou Trail. According to the Cornell University Laboratory of Ornithology, the oldest known red-tailed hawk was 28 years, 10 months old. So, they might want to keep an eye on this one. 2- Energy conservation is paying off for Saginaw Valley State University. The school recently received a rebate check totaling almost $72,000 from Consumer’s Energy. The money is a payback for installing a new, more energy-efficient chiller unit in Curtiss Hall. SVSU’s president says the university has the lowest energy cost of any campus in Michigan, based on square footage. Officials say saving on energy has helped the school to keep tuition rates relatively low for students. The rebate to SVSU was made available under the state energy act of 2008. SVSU has been working on sustainability measures since at least 1995. Those improvements have included a campus-wide energy loop to connect chillers at all of the main buildings on campus. 3 – Speaking of energy, winter is coming and with it, heating bills. Earth Gauge, a partnership between the National Environmental Education Foundation and American Meteorological Society, has compiled energy statistics for the Great Lakes region in advance of the chilly season, which officially begins Dec. 21. Some of the stats: Households in Michigan and nearby states spent an average of just over $2,000 on energy in 2009. Fifty-two percent of that went toward space heating. Most of the rest went to power appliances, electronics and lighting. Some tips to save money this winter? Allow sunlight to heat your home naturally by opening curtains and blinds on south- and west-facing windows during the day. And then close those window coverings at night to keep heat inside. Turn your thermostat while you are sleeping or away, to save money on energy costs.